Our face mask against sweat, oils,dirt, and germs get through into the foam.Keep your VR clean.NO bacterial,No facial allergy. Our face mask can provide you friendly use:Our face mask easy to install and no smell,comfort,hygiene,not affect your vision. Our face mask can solve your worries:Worry about sharing your VR?Because of personal hygiene.This is why we doing this disposable face mask.No more worry about sharing VR with friends,enjoy the fun of playing! Put the disposable face mask on the side of velcro. HIGH QUALITY MATERIAL:Our disposable face cover is made with medical non-woven fabrics with the advantages of no smell,soft,Sanitary.and provide more protection for you. SUITABLE:Good for the one who easy to sweat,oils,easy skin allergies or who often sharing VR with people like VR experience store,perfect for home and commercial use. 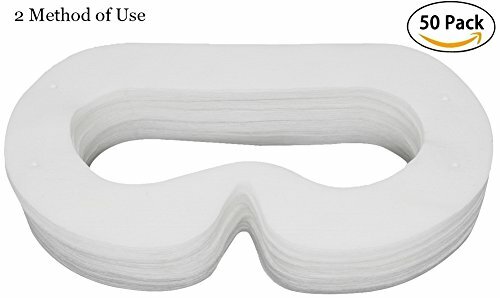 PREVENT SKIN INFECTIONSS:This sanitary disposable face mask can be prevent sweat, oils get through into the foam.Sweat/oils will be blocked on the non-woven fabrics.NO more worried about sharing your VR with friends.